A set of five porcelain shallow dishes with a petal form rim and a short foot rim that is slightly inverted. The dishes are painted in polychrome overglaze enamels, known as wucai, meaning five colours. 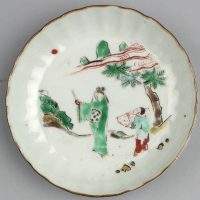 The exterior of each dish is undecorated, while the interiors are painted, all of them depicting a landscape scene with two figures, an official in a green court dress and his attendant holding a parcel, in the foreground. The thin rims are painted in brown. The underside of each dish is glazed and has a mark painted in underglaze blue. The set is contained in an old Japanese wood box. These dishes mark an interesting period in the history of Chinese ceramic art. They not only denote the beginning of greater artistic freedom amongst artists in the early 17th century, but they also signify the beginnings of the increasing use of narrative themes in literature for social and political purposes. 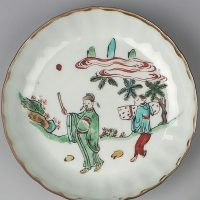 The depiction of the official and his attendant set against a backdrop of hills and rock gardens was a popular theme painted on ceramics at the time, which came to be known as the Transitional Period (1620 – 83). It is likely that these dishes were made for the Japanese market, which explains why there is a set of five and they are contained within a wood box. 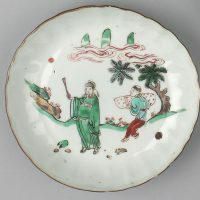 Furthermore, Japan’s prospering climate during this period meant that a more wealthy and cultured clientele was available for ceramicists to exploit and sell their works of art to. 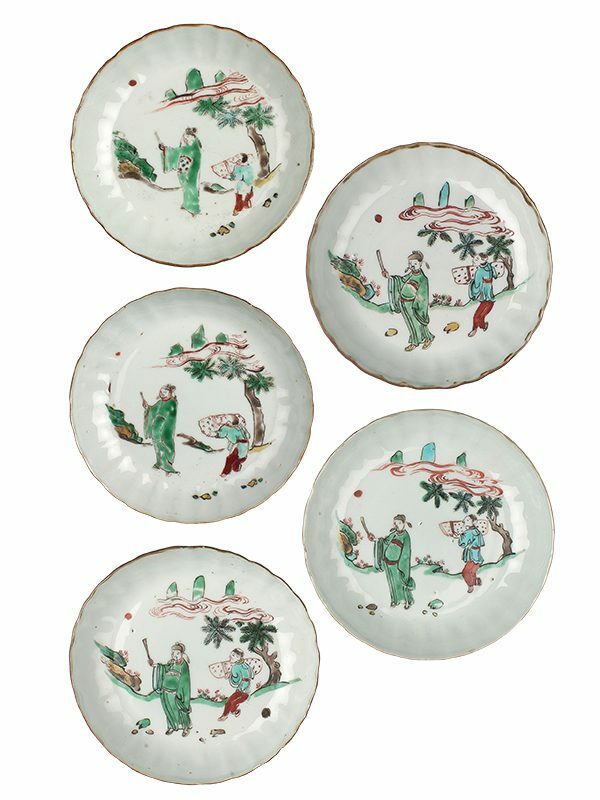 The charm of these wares can be appreciated by the fact that they have remained a set; while they depict the same overall scene, each of them is slightly different in detail from the other. 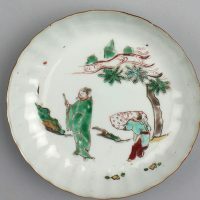 A comparable Wucai dish marked and of the Tianqi period, with a similar figure and painting technique, is in the collection of the Metropolitan Museum of Art. 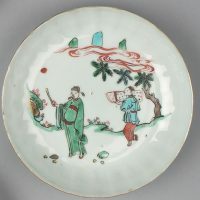 Another dish with a similar form and palette is in the collection of the Asian Art Museum, San Francisco.